On Thursday's Hardball, Chris Matthews preposterously insisted that Barack Obama added "only 13 people" to the federal workforce in 2009 and that the total number of individuals working for the U.S. government (as of 2010) was 4,443. It's bizarre that Matthews would credulously repeat such obviously wrong information. After making his grossly incorrect statement, the liberal anchor lectured, "I know it's always great rhetoric to say the government is ballooning, exploding with people. The government is getting bigger and bigger to this leviathan. And it's not." Except, it is. Audio, MP3 clip which matches the above video with excerpts from the 5 and 7 PM EST editions of Hardball. It's unclear whether the OPM's numbers come from the start of 2009 or the end, after stimulus. A fairer comparison would be from 2008, the end of Bush's term. Between 2008 and 2010, the federal workforce (total, including military) expanded by 237,000. To suggest that the government isn't "ballooning" or "getting bigger" is absurd. Fiscal spending in 2008 was just under $3 trillion. It was $3.7 trillion by 2010. That's an increase of more than 23 percent. Shouldn't have Matthews (or one of his producers) realized what he was saying? Will MSNBC correct? 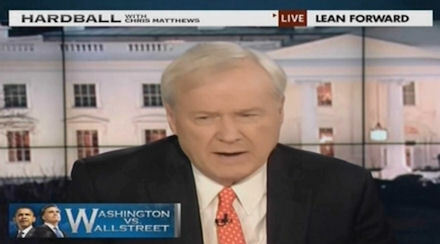 CHRIS MATTHEWS: But here he [Romney] is directing his guns at Washington. MITT ROMNEY: This president puts his faith in government. We put our faith in the American people. This President is making the federal government bigger, burdensome and bloated. I will make the federal government simpler, smaller, and smarter. He raised- He raised the national debt. I will cut cap and balance the federal budget. This President- This President has enacted job-killing regulations. I will eliminate them. MATTHEWS: Well, here's the numbers, by the way, about the size of government. According to the U.S. Office of Personnel, the federal workforce totaled 4,430 people in 2009 when Obama took office. In 2010, a year later, the number increased to 4,443, a difference of only 13 people. And local government during that time has gotten smaller dramatically. In 2009, it was 14.9 million people were working for state and local governments. But, the number dropped to 14.7 in 2010, according to the Census Bureau. So, you know, John Heilemann, I know it's always great rhetoric to say the government is ballooning, exploding with people. The government is getting bigger and bigger to this leviathan. And it's not. And if anything, there's been the reality of the economic reports to come out every first Friday of every month, which are government jobs have been depleted. They are shrinking. Everybody who lives in places like Scranton knows the pressure on mayors. And Philadelphia, a place I'm familiar with, you're always letting people go. What is- How can they keep selling the idea we have this gigantic growth of government when we also hear daily reports of lost jobs in government? MATTHEWS: But that's a result of the aging population and unemployment. You know that. It's not because they create new ideas to spend money. It's more people turn 65 every day than the day before. More people are getting sicker and using health care because they've understood what they can get from doctor's and hospital care- are using it more than ever. Those and more people are unemployed than ever before and that's why unemployment benefits and all kinds of benefits are going up.